Q: Gentlemen, before we deal with the here and now, can we kick things off by throwing things forward to 2021 and the new engine regulations. There are various elements to this and Mattia, if I could start with you, the new power unit has to hit the track in about 30 months' time. How tight is the timescale? Is it enough time? 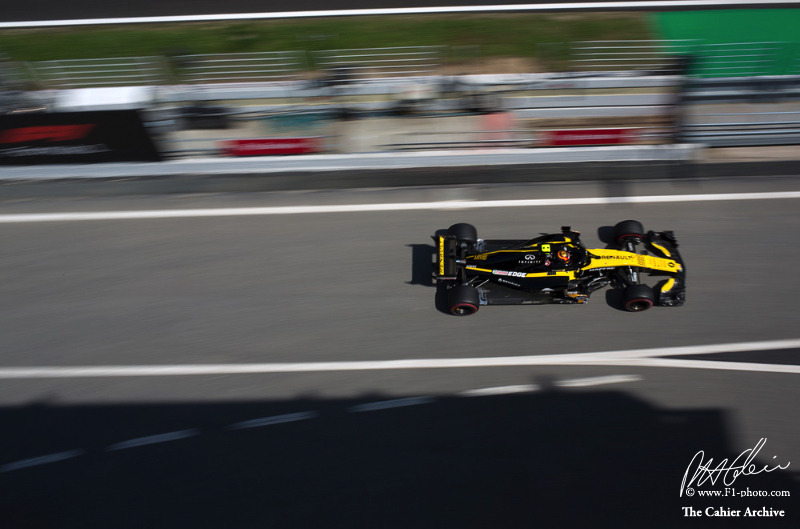 Mattia BINOTTO: Is it enough time? It will depending much on how different will be the new power unit compared to the one of today. So, no changes to the regulations, plenty of time. As much as you change it, obviously the more time you need. At the moment, so far, for what we may understand, because we are still discussing – FIA, FOM – what will be the format. We had several meetings in the last days. We have some more in the next days, let's see where it will go. But 30 months is plenty enough but it would be good to try to reach and agreement on what will be the format in really the next two to three months. Q: Andy, coming to you, there have been various presentations already, as Mattia has just referred to. Is everyone aligned as to what those regulations are going to be in '21? Andy COWELL: As Mattia says there have been several meetings, starting last summer. Discussions are never 100% aligned. There's always difference of opinion, but you end up coming up with a compromise and setting off on a direction, hopefully with enough time to do a decent job before the first race. Q: And have we found that direction now? Cowell: I think those discussions are ongoing. None of us can read a published set of regulations, so the discussions, the debate, the compromises are a work in progress. Q: Remi, can we just get Renault's take on the new engine regulations and where you would like to see them go? Remi TAFFIN: I think we wish to go forwards. We are still interested in developing the engine. We think the engine is a big part of Formula 1. As my colleagues have said, we are all discussing this, we want to get this forward. We know we have some work to do. We know we will have some changes compared to today and we have to deal with them. But the most important thing for Renault is that we all work together with the FIA and F1, to get this right and yes, to make sure that the engines keep a good part in Formula 1. Q: Tanabe-san, what's Honda's position on the new rules and specifically the MGU-H? Toyoharu TANABE: Yes, we will miss the MGU-H. I think we haven't decided everything yet for 2021. But the direction from the FIA we respect, we respect the other manufacturers' direction, but we think we will miss the MGU-H, such a high pinnacle of technology for the future and relevant to the production car as well. Q: Just to clarify: Honda would like the MGU-H to stay? Tanabe: Yes, we would like to keep that technology. Q: Remi, if I could back to you now and deal with the present. Can you just talk about the progress you've made with the power unit in Viry, where have you made the biggest gains this year? Taffin: I think the gains that we have for a few months and a few years now is through the ICE, the internal combustion engine that we have lifted the efficiency with and that's where we are focusing our efforts. Q: OK. Renault, a while back, gave Red Bull Racing a deadline of May to fix a 2019 partnership. How are those talks going and might that deadline be extended? Taffin: I think from my perspective, obviously I do not deal with contract, I leave it to my boss Cyril, and he has been speaking about that. But if we come back to the technical aspect of that, obviously there are some deadlines, which is simply based on the fact that we have to order parts. So, as a starting point, we know that by the end of this months we would have to start buying some parts to supply as many teams as we would have to for next year. So that is one of our technical deadlines. Then the rest, as I said, is all about having a contract or not with them, which is obviously on their side. Q: Tanabe-san, coming back to you, we've just been talking about Red Bull Racing's future engine partner, what can you tell us about the talks between Red Bull Racin and Honda? Tanabe: As my role, as Technical Director, I am not involved much with contract matters, but as Honda we have studied, discussed and then we had a preliminary conversation in Baku, but it is still under discussion. Q: Do you have a deadline in mind when Honda needs to know if it's supplying Red Bull Racing as well as Toro Rosso? Tanabe: We will follow the FIA regulation, but at the moment I cannot tell you exactly. Q: Let's talk about the performance of the power unit now. You obviously had a great weekend in Bahrain. Where is the power unit improved from 2017? Tanabe: Of course we work for the reliability, but not only reliability but performance as well – maybe the same as others. But we focused on the reliability from last year. We learned a lot from the previous years and we applied that type of knowledge or learning point to this year's power unit. Q: Thank you. Andy, returning to you, congratulations on that win in Baku last time out. If we've learned one thing about Formula 1 on 2018 it's that it's very tight at the top and the first question to you is whether we have seen evidence that the power advantage in recent seasons has been eroded? Cowell: The last race was very pleasing, the three races before not so. With regard to the power advantage, I think at the moment, in qualifying, then the gentleman to the right of me has a small advantage – well done! – but in racing I suspect we've got a small advantage. I think Renault and Honda are very close behind. As we discussed a couple of years ago that if you have regulation stability you do see technical solutions converge and that's what we're enjoying at the moment and we've all got the pleasure of working hard in the factories and trying to catch each other up and I think it's going to be a tight battle all the way through this year and next year, and the year after. Q: You talk about convergence: this is year five of these regulations, so how close are we getting to the limit of what you can get out of these regulations? Cowell: I think that comes down to your belief and understanding of whether there is a limit. I personally don't believe there is a limit. I think you can always find gains. Every week I have the pleasure to sit in our performance and innovation meeting and listen to bright engineers come up with ways of getting a little bit more efficiency out of the various systems and then enjoying the competition in the factory to turn those ideas in proven experiments, and then prove that they are reliable enough to come racing and compete in this wonderful environment. So, for all four us, we will continue to develop and there is no such thing as a limit. Q: Mattia, we are talking about limits, would you agree with Andy that there are no limits? Binotto: I would agree with Andy, no doubt. When you put engineers together, there will be always innovations, creativity. And for an engineer there are never limits. I think we have seen in the last years, in the last season, how much we improved, year after year and I don't think we have shown so far that we have reached the limit of the product. Q: Can we ask you about those gains that Ferrari have made, particularly over the winter coming into this season. How do you quantify those gains: how much is chassis, how much is engine? Binotto: I think we have improved in most of the areas and our spirit is really to try to improve first, what were the weaknesses of last year, try to focus, we knew that maybe on top speed we were not our best, in terms of overall efficiency we could have improved, especially on what were the fast circuits. So I think all our engineering focus was to improve the car in all the areas. I don't think we can say there is a specific area that improved the most and I'm quite pleased to see that in all the areas we made progress. Q: (Dan Knutson – Auto Action and Speedsport) Mattia, what is Ferrari's position on these recent changes for '19, especially the less complex front wing? Binotto: OK, I think that as a team we have a duty and a task to improve the show, to improve the Formula 1. I think that certainly the regulations may be a good step in that respect. It is a big change, a drastic change to the rules, to the aero. I think each team will be focused on develop what are the new regulations, it's quite a game changer, but overall I think from an egoistic point of view we could have stuck with what we had at the moment but I think that looking at the show and the good for the sport, it was the right choice. Q: (Sam Collins – Racecar Engineering) With the growing move to electrification in the Automotive industry, how relevant is the current battery technology in Formula One to production cars and, going forward to 2021, how much freedom would you like in terms of battery technology. Taffin: I think we still like, as engineers, to develop batteries but I guess at the beginning we all have different interests in batteries, whether we wish to develop a chemistry ourselves or not, for sale, for example, so it's really depending on the intent. As far as Renault is concerned, the Group is liking us to develop so I think we eventually wish to have some development in that area. And then, what we've got now is not a bad solution. We can do our work, we can make some progress, we can make some differentiation and at the end of the day we wish to keep that freedom. Whether we need to have that complete freedom as we have now, whether we have to proscribe some element of that, it's another territory that obviously we are discussing these days. Binotto: So, how much our battery technology are relevant for our cars, automotive, certainly they are. If we look at LaFerrari GT cars, the technology of the batteries is coming from F1 directly, so certainly it is relevant. Looking at 2021 again, I think as Ferrari it's important we maintain freedom in developing the key technologies. So we are certainly against any standardisation or big proscriptions on key technologies. Certainly whatever is related to the power unit , which, for Ferrari, is a key element. Cowell: I think all the batteries that we've got are high-performance road relevant in terms of their power density. I think we're lagging in terms of the energy density. I think it would be good if the regulations encouraged us to develop higher energy densities – because that is something that's particularly relevant to mobility. If you think about 2021, then there's a lot of electric-only cars that are going to be on the market there – but we're in this. We're torn. You're talking to a group of engineers who like to develop new technology, that like to be pushed to drive to the pinnacle of technology. The regulations for 2021 are heading in a downwards step with regards to technology, with the removal of the electrical energy that we get from the MGU-H. Sixty per cent of the electrical energy comes from the MGU-H, we will be going to just a KERS system and therefore the demands on the battery are perhaps a little bit less. I personally, as an engineer, would like to see more on the electrical hybrid side and more of a challenge on the energy density of the battery because I think that would draw more blue-chip companies into this industry. It's one of the most amazing development platforms on this planet and we'd all like to look after the planet. Tanabe: I think our hardware itself, it's not a direct move to the production car area. I think to keep developing the energy management itself and we can learn a lot. And then we can move that technology. Energy management also controls systems. We can improve and that helps our production car areas as well. We can cooperate with production car area. Then keep working on that area is a high technology challenge for us. I'd say it's important for us as well. Q: (Scott Mitchell – Autosport) Question for Mattia, Andy and Remi. Honda will miss the MGU-H and would like to keep it. Do you share that view – and why do you think it will no longer be a part of the F1 engine from 2021? Cowell: I share the view of Honda. I think the MGU-H has been blamed for the lack of noise, for high complexity. It's been referred to as a miracle. There are four technology companies that have made it work and get 60 per cent of their electrical energy to then power the K. It contributes 5% of the thermal efficiency of the power unit and to make up the power difference we're going to have to increase the fuel flow rate, which I think is a backwards step. It's not progress, so, my view is the H should stay because the development has been done. Removing it removes a lot of energy, which is a lot of car performance. Yeah, it feels like a backwards step when the development work's been done. We will all now start developing anti-lag systems. The MGU-H is the most marvellous anti-lag system on a turbocharged engine because it gives you speed control. That's been removed so we'll now have to come up with various devices and systems and that will probably involve burning some fuel in the exhaust which doesn't feel like the most honourable thing to do, as an engineer. But, as I've said previously, it's a balance between technology and entertainment. We've got to get that balance right. Binotto: I think that Andy has already illustrated, certainly the MGU-H is a fantastic, efficient component, for the reason he mentioned. But looking ahead, we know that we know we need to find a compromise. The compromise based on what are the main objectives of 2021: spectacle; noise; simplification; cost. When you are dealing with compromises, there may always be different opinions and I think somehow we may accept the MGU-H to be removed but certainly removing the MGU-H doesn't mean that we fully need to standardise the power units and the engines. There are still areas in which we believe an engine is a key element, a key technology and important that we still maintain the challenge in these technologies and we try to maintain the engine, or the power unit, as a competitive differentiator between manufacturers – because that's about the DNA of the sport, and F1. Taffin: I think I will have to make the sum-up of what has been said but I think first all three of us have voted to keep the MGU-H, and that was an initial proposal that we have made but there was some alternatives that we're not taking the way of, and again we're trying to have good discussions to go forwards for keeping developing this power unit. It may be in a different way, try to keep some more fun for anyway. So, again, at the end of the day, we're doing the job these days to make sure the power unit in '21 is where we need to be. And then, yes, we did a lot of work on the MGU-H. We have these things working and it's a very nice tool, or piece or part – but at the same time I would maybe bounce back on the last question we have, it is not something we will put on the shelf and just forget. As far as Renault is concerned, we have some other projects, we are working on Formula E where battery is also of an interest, so we also work on that front. MGU-H is not directly transferred to Formula E but it's a very high-speed motor and it's quite a unique technology and again, we're not going to put that on the shelf, so it's all going to be of interest. Q: (Christian Menath) Andy mentioned earlier that it's work in progress and there are discussions and everyone has a different opinion. Obviously you all share the opinion on the MGU-H, but can I please ask each one of you where he personally has problems with the proposal that is on the table yet with the engine regulation for 2021. Tanabe: I think we have a lot of things to make clear for the detail. So, we generally have a good summary but we don't have any detail. So, that area we are trying to make clean and this is under discussion. I think many, many ideas. Cowell: I'm not sure it's appropriate to discuss all the details of the ongoing discussion. The MGU-H is a topic that's already been in the media over the last three years, it's been blamed for all the evils of Formula One power units, so there's a lot of commentary out there and so discussing that feels appropriate. Going into others details, it's probably best if we have a press conference in a month's time when the regulations are… or whenever the regulations come out. Q: Andy, I was going to ask you, when you want to see the regulations some out? Cowell: I think so long as the regulations come out over the next few months and, as Mattia rightly pointed out, as long as it's not a complete tear-up of what we currently have, then there's sufficient time to do a professional job, so we don't embarrass ourselves at the beginning of 2021. Q: Mattia, any more thoughts? Binotto: No, they summarised. The current discussions are just at the very start so very… let me say 'green', or not mature at the moment, with regulations. Very difficult to judge or to comment. As I said, I think as Ferrari, but I'm sure they are joining, it would be a shame to standardise or to limit much, especially compared to what we've got today, so reducing some freedom compared to today would be somehow a shame. I believe we should keep up the challenge. Q: Remi, anything you'd like to add? Taffin: I think maybe the most important is not the proposals, which could be very different to what we see in the last three or four months, but it's the objectives that we see at the beginning of our discussion. I think as far as the objectives are concerned, we will tackle all of them and we will have, at the end, we will have a proposal that is able to do that – which I guess is the most important for all the parties. FIA, F1, us. That's what we are working for. It's also true that we have to make sure, when we work on that proposal, we work out the right change in the right time frame, so that we can do a proper job and be ready for 2021. Q: (Joe van Burik) A question to everyone. Do you think taking out the MGU-H will improve the balance across all four power units in terms of performance and reliability or should we look at completely different solutions? Taffin: No (I don't think it will even out the performance). As we say, we've done the job, we've got the MGU-H, which is working where we wish to be. Obviously, it's a big part of the performance of our power unit but as Andy mentioned it's part of its efficiency, we've worked that out and as we say we still jhave to make sure that every single drop of fuel is burned as efficiently as possible, then it's the work on the ICE, it's work on the turbo and obviously if we have to get rid of the ICE and turbo and that's what we will make the efficiency out of. So, it's not going to let's say bring any levelling of any performance or reliability – we're there. Q: Mattia, anything to add? Cowell: I guess one of the things we all wish is that there were 10 of us sat here, that there were 10 manufacturers in the sport – 10 teams, 10 power unit manufacturers. And there is a desire from us and from the FIA and Formula 1 and so removing the H does that help a new entrant come in – quite possibly. We've offered to help with technology transfer to help a new entrant. The best way to make it easier for a new entrant is to take some of the systems away, the ones that are perceived to be complex. Tanabe: We are working on the future, so it is still under discussion. Q: Without the H do you think it would help Honda. Q: (Michael Schmidt – Auto Motor und Sport) This year we have the rule that you can only use three engines, MGU-K, H and two batteries and I guess at the beginning of the season, every one of you was striving to do the whole season with these three. Now, knowing the balance of power, somebody has to catch up, somebody wants to get an advantage again. Is it worth thinking, now, to introduce maybe a fourth engine in order to have more scope of development, to have another development step in order to get ahead of somebody else or catch up? Binotto: I think that when you're setting your development programmes, you are not looking at the others but to yourself. As I was saying before, I think that we are looking to our (inaudible) and trying to improve, so we made a programme looking at ourselves and not to the others. We knew that it was three engines per the season, our pack is three engines per season, I don't think that will change, whatever is the balance, because the best way somehow to achieve or optimise your performance is trying to optimise your own performance and not relative to the others. Again, at this stage of the season, we are in Spain, if you look, no one has introduced, at least, to the second power unit, so I think we are all trying to go longer on the life of the power units and to manage the three engines per season. Taffin: I think we knew we had to go to three ICEs and energy store a few months ago, a lot more than that, and as far as I am concerned, we have taken this on board and we have done everything we could to make sure that we stick to that rule because obviously the quicker way, actually, when you are 18 months ahead of going into a season, is to make sure that you keep to the new rules and try to exploit them as much as you could so in terms of reliability, you would try and stick to that. Obviously the closer you get to the points, to go racing with this power unit, you have to have a look at what you've got and try to optimise, so maybe the optimisation is a bit different but as far as we are concerned, we are going to the season and we will try and go as quick as possible. If it needs to be three ICEs, then we are ready to do the season on three ICEs. If for some reason, there is an opportunity to get more performance and optimisation we have to get the fourth ICE, then so be it, but I wouldn't say it's something that you just throw on the table and follow other plans. The plan is to try and get the rules in and be the best with that rule. Tanabe: We had a poor start in Melbourne and unfortunately we lost some units already but we stick to the regulations and then also we are developing the performance and the reliability and then when we are comfortable to apply those development items we will update but basically we stick to the Formula One regulations. Q: What can you tell us about those performance upgrades; when can we expect to see them? Tanabe: I don't mention specific timing now. Cowell: I think, as Mattia said, you run your own race, you look at your own situation and you move on and now again you have curved balls come towards you. Some of them are miserable curved balls; if you have a quality issue and a failure. Some of them are happy curved balls: if you discover 10 kilowatts in performance development, you might suddenly to decide to introduce an extra engine towards the end of the year, but I think we all support the rules. The direction has been in place over the last ten years where progressively we've reduced the amount of hardware we use in racing because it's cheaper for the customers, and it actually helps reduce the cost of performance development in the factory, because if you have a power unit that will do 5000 kilometers before it needs rebuilding compared to one that does 2000, you can get a lot more performance development done, so you build less. So I think it's healthy for the factory, healthy for the industry and maybe we should get together in Abu Dhabi and see where we've all ended up. Q: (Julien Billiotte – AutoHebdo) Mattia, can you explain the concept behind the new rear view mirrors we've seen dropping down from the halo of the Ferrari and what sort of gains you are trying to achieve there? Binotto: When developing aerodynamics you are looking at all the opportunities you've got which are allowed by the regulations. These mirrors are as well somehow positioned in a better area for the drivers, looking not only behind but ahead as well, front tyres or whatever, so it's normal development. I think you may judge why a mirror as you've done for a wing or a bargeboard or a turning vane, so it's simple development, coming from the creativity of the engineers. Q: (Luigi Perna – La Gazzetta dello Sport) There is much speculation around oil burning and the federation confirmed to have improved its controls on this side. Is that technology really useful in Formula One and how much theoretically can it influence the performance, especially in qualifying? Taffin: The short answer from us is that we never experienced this oil burning thing, so I would not give you any effect from that but as a simple thing, we are a fuel flow limited formula so obviously the more combustible you can find and put into the ICE, the more power you will get through, so it's as simple as that. Binotto: First of all, the regulations are discussing about oil consumption and not oil burning and I think we should distinguish what the FIA has done for this season is to reduce the overall oil consumption, the average in the race which has somehow been reduced to 0.6 litres per hundred kilometres. I think that all the manufacturers now simply stick to it. The FIA are certainly controlling it at each session, they've got all the data, telemetry and I'm pretty sure that all the manufacturers are simply sticking to the regulations. How much does it affect the performance? It may have a bit of an influence but if you look at the performance of the power units today compared to last year I think they are much equivalent so it's not overall much influence. Cowell: I think in the regulations prior to this year there were some loopholes. I think the FIA have closed down the size of that hole and you know we all work with the FIA to flag issues and then work with them to come up regulations that make sure that the prime focus is on the honourable quest for making the thermal efficiency of the engine better and the efficiency of the hybrid systems better. Tanabe: We follow FIA regulations, 600cc per hundred kilometres, then we maintain that number and then I don't know how much, I mean, the gain, with that system. Just to follow the Formula One regulations. Q: (Scott Mitchell – Autosport) Andy, just picking up on something you mentioned earlier about offering to help with tech transfer for possible new engine manufacturers; could you just elaborate a little on whether that's a new position from Mercedes in terms of being willing to help a possible competitor, and to what extent would you go in terms of assisting them technically? Cowell: It's not a recent thing, it's something that we've always supported. We've always been keen to provide our fair share of customer teams and I guess a few years ago, more than our fair share and we've always supplied exactly the same performance level there so the topic of a newcomer then… we're keen to help, so long as the regulations permit us to help, so that's why that's been discussed with the FIA and Formula One. And how far would we go? We'd go as far as was required to help the newcomer and I guess that support would then taper out. We really would like more manufacturers to be in to make the sport healthier. Q: Can I just ask that question to the other manufacturers with customer teams? Mattia, would Ferrari help a newcomer, a new manufacturer to Formula One? Binotto: I think it would be good for the sport, new manufacturers. I think we would help them certainly, through the regulations, as we said, in order to reduce some complexity or not to frighten newcomers as to what is the complexity of our technology at the moment. So we would support it, certainly through regulations. I think that's the best we can do. Q: And Remy, would Renault help a new manufacturer coming into Formula One? Taffin: I think we would have to define the frame of that but obviously we are discussing that. We will be looking at this and we will see where we get but we really appreciate to have top competition. We at Renault are already helping teams because we have customer teams so we supply power units. Whether it comes to a part or a fraction of that power unit is a different matter and it's being discussed.